Her Majesty's Most Honourable Privy Council, usually known simply as the Privy Council, is a formal body of advisers to the Sovereign of the United Kingdom. Its membership mainly comprises senior politicians, who are present or former members of the House of Commons or the House of Lords. The Privy Council formally advises the sovereign on the exercise of the Royal Prerogative, and corporately (as Queen-in-Council) it issues executive instruments known as Orders in Council, which among other powers enact Acts of Parliament. The Council also holds the delegated authority to issue Orders of Council, mostly used to regulate certain public institutions. The Council advises the sovereign on the issuing of Royal Charters, which are used to grant special status to incorporated bodies, and city or borough status to local authorities. Otherwise, the Privy Council's powers have now been largely replaced by the Cabinet of the United Kingdom. Witenagemot was an early equivalent to the Privy Council of England. During the reigns of the Norman monarchs, the English Crown was advised by a royal court or curia regis, which consisted of magnates, ecclesiastics and high officials. The body originally concerned itself with advising the sovereign on legislation, administration and justice. Later, different bodies assuming distinct functions evolved from the court. The courts of law took over the business of dispensing justice, while Parliament became the supreme legislature of the kingdom. Nevertheless, the Council retained the power to hear legal disputes, either in the first instance or on appeal. Furthermore, laws made by the sovereign on the advice of the Council, rather than on the advice of Parliament, were accepted as valid. Powerful sovereigns often used the body to circumvent the Courts and Parliament. For example, a committee of the Council — which later became the Court of the Star Chamber — was during the fifteenth century permitted to inflict any punishment except death, without being bound by normal court procedure. During Henry VIII's reign, the sovereign, on the advice of the Council, was allowed to enact laws by mere proclamation. The legislative pre-eminence of Parliament was not restored until after Henry VIII's death. Though the royal Council retained legislative and judicial responsibilities, it became a primarily administrative body. The Council consisted of forty members in 1553, but the sovereign relied on a smaller committee, which in the following century evolved into the modern Cabinet. According to the Oxford English Dictionary, the definition of the word privy in Privy Council is obsolete meaning "of or pertaining exclusively to a particular person or persons, one's own"; hence the Council is personal to the sovereign. It is closely related to the word private, and derives from the French word privé. The sovereign may appoint anyone a Privy Counsellor, but in practice appointments are made only on the advice of the Her Majesty's Government, and generally consist only of senior Members of Parliament, the Church of England and HM Judiciary. There is no statutory limit to its membership: at January 2012, there were about 600 members, which rose in number to over 650 by June 2015. The Church of England's three senior bishops—the Archbishop of Canterbury, the Archbishop of York and the Bishop of London—become Privy Counsellors upon appointment. Senior members of the Royal Family may also be appointed: Prince Philip is a member being its most senior at present by length of service, and he is the only current PC not appointed by the reigning monarch, having been sworn of the Council by her father. The Private Secretary to the Sovereign is always appointed a Privy Counsellor, as are the Lord Chamberlain, the Speaker of the House of Commons, and the Lord Speaker. Justices of the Supreme Court of the United Kingdom, judges of the Court of Appeal of England and Wales, senior judges of the Inner House of the Court of Session (Scotland's highest law court) and the Lord Chief Justice of Northern Ireland also join the Privy Council ex officio. Privy Counsellors are bound by oath to keep matters discussed at Council meetings secret, the appointment of the Leaders of Opposition Parties as Privy Counsellors allows the Government to share confidential information with them "on Privy Council terms". This usually only happens in special circumstances, such as in matters of national security. For example, Tony Blair met Iain Duncan Smith (then Leader of HM Official Opposition) and Charles Kennedy (then Leader of the Liberal Democrats), "on Privy Council terms" to discuss the evidence for Iraq's weapons of mass destruction. Although the Privy Council is primarily a British institution, officials from some other Commonwealth realms are also appointed. By 2000, the most notable instance was New Zealand, whose Prime Minister, senior politicians, Chief Justice and Court of Appeal Justices were traditionally appointed Privy Counsellors. However, appointments of New Zealand members have since been discontinued. The Prime Minister, the Speaker, the Governor-General and the Chief Justice of New Zealand are still accorded the prefix Right Honourable, but without membership of the Council. Until the latter part of the 20th century, the Prime Ministers and Chief Justices of Canada and Australia were also appointed Privy Counsellors. Canada also has its own Privy Council, the Queen's Privy Council for Canada (see below). Prime Ministers of some other Commonwealth countries that retain the Queen as their sovereign continue to be sworn of the Council. Privy counsellors can choose to affirm their allegiance in similar terms should they prefer not to take a religious oath. At the induction ceremony, the order of precedence places Anglicans (being those of the established church) before others. The initiation ceremony for newly appointed Privy Council is held in private and typically requires kneeling on a stool before the sovereign and then kissing hands. According to the The Royal Encyclopaedia: "The new privy counsellor or minister will extend his or her right hand, palm upwards, and, taking the Queen's hand lightly, will kiss it with no more than a touch of the lips." The ceremony has caused difficulties for privy counsellors who advocate republicanism; Tony Benn said in his diaries that he kissed his own thumb, rather than the Queen's hand, while Jeremy Corbyn reportedly did not kneel. Not all members of the privy council go through the initiative ceremony; appointments are frequently made by an Order in Council, although it is "rare for a party leader to use such a course." Membership is conferred for life. Formerly, the death of a monarch ("demise of the Crown") brought an immediate dissolution of the Council, as all Crown appointments automatically lapsed. By the 18th century, it was enacted that the Council would not be dissolved until up to six months after the demise of the Crown. By convention, however, the sovereign would reappoint all members of the Council after its dissolution. In practice, therefore, membership continued without a break. In 1901 the law was changed to ensure that Crown Appointments became wholly unaffected by any succession of monarch. The sovereign however may remove an individual from the Privy Council. On 8 June 2011, the former MP Elliot Morley was expelled following his conviction on charges of false accounting in connection with the British parliamentary expenses scandal. Before this, the last individual to be expelled from the Council against his will was Sir Edgar Speyer Bt, who was removed on 13 December 1921 for collaborating with the enemy German Empire, during the First World War. Individuals can choose to resign, sometimes to avoid expulsion: three members voluntarily left the Privy Council in the 20th century: Jonathan Aitken, on 25 June 1997 following allegations of perjury, John Profumo, who resigned on 26 June 1963, and John Stonehouse, who resigned on 17 August 1976. On 4 February 2013, Chris Huhne announced that he would voluntarily leave the Privy Council after pleading guilty to perverting the course of justice. The Lord Prescott stood down on 6 July 2013 as an act of protest expecting others to follow, and Denis MacShane was forced to resign on 9 October 2013; both are former Labour MPs. Meetings of the Privy Council are normally held once each month wherever the sovereign may be in residence at the time. The quorum, according to the Privy Council Office, is three, though some statutes provide for other quora (for example, section 35 of the Opticians Act 1989 (c. 44) provides for a lower quorum of two). Few Privy Counsellors are required to attend regularly. The settled practice is that day-to-day meetings of the Council are attended by four Privy Counsellors, usually the relevant Minister to the matters pertaining. The Cabinet Minister holding the office of Lord President of the Council, currently the Rt Hon Chris Grayling MP, invariably presides. Under Britain's modern conventions of parliamentary government and constitutional monarchy, every order made in Council is drafted by a Government Department and has already been approved by the Minister responsible — thus actions taken by the Queen-in-Council are formalities required for validation of each measure. 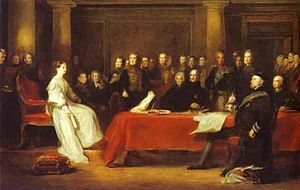 Full meetings of the Privy Council are held only when the reigning sovereign announces his or her own engagement (which last happened on 23 November 1839, in the reign of Queen Victoria); or when there is a demise of the Crown, either by the death or abdication of the monarch. A full meeting of the Privy Council was also held on 6 February 1811, when George, Prince of Wales was sworn in as Prince Regent by Act of Parliament. The current statutes regulating the establishment of a regency in the case of minority or incapacity of the sovereign also require any regents to swear their oaths before the full Privy Council. In the case of a demise of the Crown, the Privy Council — together with the Lords Spiritual, the Lords Temporal, the Lord Mayor and Aldermen of the City of London as well as representatives of Commonwealth realms — makes a proclamation declaring the accession of the new sovereign and receives an oath from the new monarch relating to the security of the Church of Scotland, as required by law. It is also customary for the new sovereign to make an allocution to the Privy Council on that occasion, and this Sovereign's Speech is formally published in The London Gazette. Any such Special Assembly of the Privy Council, convened to proclaim the accession of a new sovereign and witness the monarch's statutory oath, is known as an Accession Council. The last such meetings were held on 6 and 8 February 1952: as Elizabeth II was abroad when the last demise of the Crown took place, the Accession Council met twice, once to proclaim the sovereign (meeting of 6 February 1952), and then again after the new queen had returned to Britain, to receive from her the oath required by statute (meeting of 8 February 1952). The sovereign also grants Royal Charters on the advice of the Privy Council. Charters bestow special status to incorporated bodies; they are used to grant "chartered" status to certain professional, educational or charitable bodies, and sometimes also city and borough status to towns. The Privy Council therefore deals with a wide range of matters, including university and livery company statutes, churchyards, coinage and dates of bank holidays. The Committee for the purposes of the Crown Office Act 1877 consists of the Lord Chancellor and Lord Privy Seal as well as a Secretary of State. The Committee which last met in 1988 is concerned with the design and usage of wafer seals. the Gibson Committee of enquiry set up in 2010 – to consider whether the UK security services were complicit in torture of detainees. Peers below the rank of marquess who are not members of the Privy Council are nowadays customarily prefixed with "The" before their title, omitting "The Right Honourable", although this used to be considered to be correct form when addressing them in writing (prior to 1999). All those sworn of the Privy Council, including barons, viscounts, and earls, are accorded the style "The Right Honourable"; non-royal dukes are styled "The Most Noble" and marquesses as "The Most Honourable". Modern custom as recommended by Debrett's is to use the post-nominal letters "PC" in a social style of address for peers who are Privy Counsellors. For commoners, "The Right Honourable" is sufficient identification of their status as a Privy Counsellor. The Ministry of Justice revises current practice of this convention from time to time. Only Privy Counsellors can be signatories, by the monarch's command i.e. Royal Assent, to the examination of a Bill affecting the rights of the Crown. Privy Counsellors technically are allowed to sit on the steps of the Sovereign's Throne in the Chamber of the House of Lords during debates, a privilege which was shared with heirs apparent of those peerage titles who were to become members of the House of Lords before Labour's partial Reform of the Lords in 1999, diocesan bishops of the Church of England yet to be Lords Spiritual, retired bishops who formerly sat in the House of Lords, the Dean of Westminster, Peers of Ireland, the Clerk of the Crown in Chancery and the Gentleman Usher of the Black Rod. Nowadays this privilege is rarely exercised. Several other Privy Councils have advised the sovereign. England and Scotland once had separate Privy Councils (the Privy Council of England and Privy Council of Scotland). The Acts of Union 1707, which united the two countries into the Kingdom of Great Britain, created a single body, and the Scots Privy Council was abolished on 1 May 1708. Ireland, on the other hand, continued to have a separate Privy Council even after the Act of Union 1800. The Privy Council of Ireland was abolished in 1922, when the southern part of Ireland separated from the United Kingdom; it was succeeded by the Privy Council of Northern Ireland, which became dormant after the suspension of the Parliament of Northern Ireland in 1972. No further appointments have been made since then, and only four appointees were still living as of May 2014. ^ Edited by Edmund Weiner and John Simpson. (1991). The Compact Edition of the Oxford English Dictionary (Second Edition). Oxford University Press. ISBN 0-19-861258-3. ^ "Departmental Plan 2004/05" (PDF). Privy Council Office. Retrieved 11 September 2008. ^ The London Gazette: (Supplement) no. 56070. p. 1. 30 December 2000. ^ "Bishop of London". Diocese of London. Retrieved 15 August 2008. ^ "English Judges and the Bar: Court of Appeal and High Court". Forms of address. Ministry of Justice. 2008. Retrieved 15 August 2008. ^ "Scottish Judges and the Bar". Forms of address. Ministry of Justice. 2008. Retrieved 15 August 2008. ^ "Northern Ireland Judges and the Bar". Forms of address. Ministry of Justice. 2008. Retrieved 15 August 2008. ^ e.g. Nicholas Clegg, Leader of the Liberal Democrats "Privy Council Appointment of Nicholas Clegg MP". Prime Minister's Office. 18 January 2008. Retrieved 12 September 2008. ^ e.g. David Hanson, Minister of State, "Privy Council Appointment of David Hanson MP". Prime Minister's Office. 20 February 2007. Retrieved 12 September 2008. ^ e.g. Jeffrey Donaldson, MP "Privy Council Appointment of Jeffrey Donaldson and Peter Robinson". Prime Minister's Office. 9 May 2007. Retrieved 12 September 2008. ^ Hattersley, Roy (14 December 2000). "Let's abolish this absurdity". The Guardian (Guardian News and Media). Retrieved 24 April 2010. Quoting those words from the Privy Council's oath is certainly an offence and possibly treason. ^ Privy Council: Guide to its origins, powers and members, BBC News (October 8, 2015). ^ a b c Privy council: Jeremy Corbyn did not kneel for the Queen, Guardian (November 11, 2015). ^ Patrick Wintour, [www.theguardian.com/lPatrick Wintourw/2015/oct/08/jeremy-corbyn-rejects-formal-privy-council-induction-by-queen Jeremy Corbyn rejects formal privy council induction by Queen], Guardian (October 8, 2015). ^ The most recent enactment deferring dissolution was the Succession to the Crown Act 1707 (6 Ann. c. 41). Complete text as originally enacted. Text of the Succession to the Crown Act 1707 as in force today (including any amendments) within the United Kingdom, from the UK Statute Law Database . Section VIII provided, "... the Privy Council of Her Majesty, her heirs or successors for the Kingdom of Great Britain, shall not be determined or dissolved by the death or demise of Her Majesty, her heirs or successors; but such Privy Council shall continue and act as such by the space of six months next after such demise, unless sooner determined by the next successor to whom the imperial Crown of this realm is limited and appointed to go, remain, and descend; ..." Despite becoming obsolete in 1901, this section remained on the statute book until it was repealed by the Statute Law (Repeals) Act 1973 (c. 39), section 1(1) and Schedule 1 part I. ^ The Demise of the Crown Act 1901 (1 Edw. 7 c. 5), "An Act to amend the Law relating to the Holding of Offices in case of the Demise of the Crown" (original text), Text of the Demise of the Crown Act 1901 as in force today (including any amendments) within the United Kingdom, from the UK Statute Law Database . Section 1(1) provides, "The holding of any office under the Crown, whether within or without His Majesty's dominions, shall not be affected, nor shall any fresh appointment thereto be rendered necessary, by the demise of the Crown." The act came into force within six months of the death of Victoria and section 1(2) ensured that no offices were vacated on the subsequent accession of Edward VII. See also commentary in Appendix 2 of the report that preceded the 1973 Act: Law Commission, Scottish Law Commission (1972). Statute Law Revision: Fourth Report. London: Her Majesty's Stationery Office. pp. 30–55. ISBN 0-10-151080-2. Retrieved 7 June 2010. (LC 49, SLC 26, Cmnd 5108). ^ The London Gazette: no. 59820. p. 11257. 14 June 2011. ^ The London Gazette: no. 32547. p. 10123. 12 December 1921. ^ The London Gazette: no. 54817. p. 4381. 26 July 1997. ^ The London Gazette: no. 43041. p. 5533. 28 June 1963. ^ The London Gazette: no. 46994. p. 11347. 19 August 1976. ^ The London Gazette: no. 48172. p. 6361. 29 April 1980. ^ ThirdWay – Google Boeken. Books.google.com. Retrieved 13 August 2012. ^ "Civil Service Order in Council 1995 (as amended between 1995 and 2005)" (PDF). Civil Service Commissioners. Retrieved 7 June 2010. ^ "Judgments – R (On The Application of Bancoult) V Secretary of State for Foreign and Commonwealth Affairs" (PDF). Retrieved 2014-10-06. ^ a b "Privy Counsellors and Crown Appointments". Debrett’s. Retrieved 15 June 2015. ^ Walker, A; Wood, E (14 February 2000). "The Parliamentary Oath" (PDF). Research Paper 00/17. House of Commons Library. Archived from the original (PDF) on 23 May 2008. Retrieved 8 September 2008. ^ "Modernisation of the House of Commons—Fourth Report: Precedence for Privy Counsellors". Modernisation of the House of Commons Select Committee. 4 March 1998. Retrieved 8 September 2008. ^ "Federal Executive Council Handbook" (PDF). Australian Government, Department of the Prime Minister and Cabinet. June 2005. Retrieved 9 September 2008. Cox, N (2002). "The Abolition or Retention of the Privy Council as the Final Court of Appeal for New Zealand: Conflict Between National Identity and Legal Pragmatism". New Zealand Universities Law Review 20. doi:10.2139/ssrn.420373. Gay, O; Rees, A (2005). "The Privy Council" (PDF). House of Commons Library Standard Note. SN/PC/2708. Retrieved 13 May 2010. Hayter, P (2007). Companion to the Standing Orders and guide to the Proceedings of the House of Lords (21st ed.). Iwi, E (1937). "A Plea for an Imperial Privy Council and Judicial Committee". Transactions of the Grotius Society (Transactions of the Grotius Society, Vol. 23) 23: 127–146. (subscription required (help)). David Rogers (2015) By Royal Appointment : Tales from the Privy Council – the unknown arm of Government, London : Biteback Publishing. This page was last modified on 30 November 2015, at 15:18.